A unique collection of 1618 marketed drugs for high throughput screening (HTS) and high content screening (HCS). • Nat Commun . 2018 Dec 10;9(1):5272. • Theranostics . 2018 Jan 1;8(3):830-845. 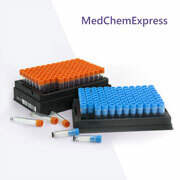 • A unique collection of 1618 marketed drugs for high throughput screening (HTS) and high content screening (HCS).